We are honored to announce that for the fifth year in a row, Polin Waterparks has been honored with multiple European Star Awards in the category of “Europe’s Best Waterslides.” Polin Waterparks received this recognition at this year’s Euro Attractions Show (EAS) during a special ceremony on Sept. 19, 2016, at Port Aventura World in Barcelona, Spain. The event took place the evening before EAS – the largest attractions exhibition in the amusement industry – officially kicked off on Sept. 20. Park operators and manufacturers were awarded their prizes personally after an independent, international trade jury voted for and ranked the most remarkable attractions, waterslides, rollercoasters and theme parks in Europe. The prizes are considered a rare distinction for attraction designers and theme parks, proving their exceptional achievements. Sohret Pakis, Director of Marketing and Communication of Polin Waterparks, says the results represent Polin’s ongoing dedication to quality, innovation and technology. “We’re as proud today as the very first time we won a European Star Award,” she adds. “We take these awards very seriously, because they are official recognition of our dedication to delivering innovative, game-changing attractions. We will continue to focus on designing the most creative waterslides that pique customers’ interests and ensure we maintain the trust of our partner parks. And we will never stop innovating, because people’s interests will never stop evolving. So we will continue to evolve, too. Each year since its inception, the European Star Awards has honored Polin Waterparks 12 times. 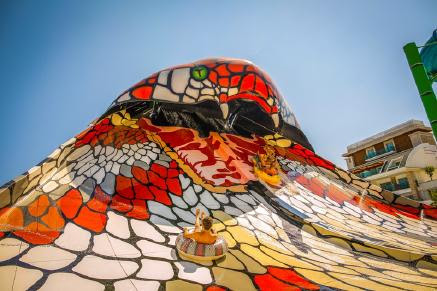 The first year the European Star Awards were announced, in 2012, Polin won First Place in the category of “Europe’s Best Waterslides” for its King Cobra attraction at Aqualand Frejus in France. Since then, Polin has continued to rack up wins in the annual competition, which is hosted by Kirmes & Park Revue magazine. ① Unique appearance. It is the first and the only waterslide in the World that has its own fiberglass theme built in itself. While many parks customize their King Cobra to match their themes, others continue to install the ride with its original design: bold red, black and white scales with a ferocious cobra head that reaches an imposing height of 50 feet (15.24 meters). ② Thrilling riding experience. King Cobra’s configuration enables two double tubes (4 riders) to race along a circular path filled with twists and turns, catapulting them through open and closed tubes before they confront a heart-pounding plunge nearly 25 feet (8 meters) and accelerate up to 32 mph (51 km/h). ③ Resin transfer molding (RTM) manufacturing. The ride – like all of Polin’s waterslides- is made via RTM, a latest composites manufacturing technique that creates slide components that are smooth and shiny on both sides with zero rough edges and perfect component alignment. ④ Special effects. The ride itself is enough to become addictive for many guests. But when parks add Polin’s unique extra effects – such as fog, sound and lighting – the ride’s thrills are magnified. Aqualand Frejus, France, First Place in “Europe’s Best Waterslides” for the King Cobra. Aqualand Frejus, France, Second Place in “Europe’s Best Waterslides” for King Cobra for King Cobra. Aqua Fantasy, Turkey, Fifth Place in “Europe’s Waterslides” for Polin’s Super Combo slide.